GIBRALTAR: Gibraltar is truly a unique place for those curious travelers. It’s an overseas U.K. territory by the breathtaking Mediterranean Sea. 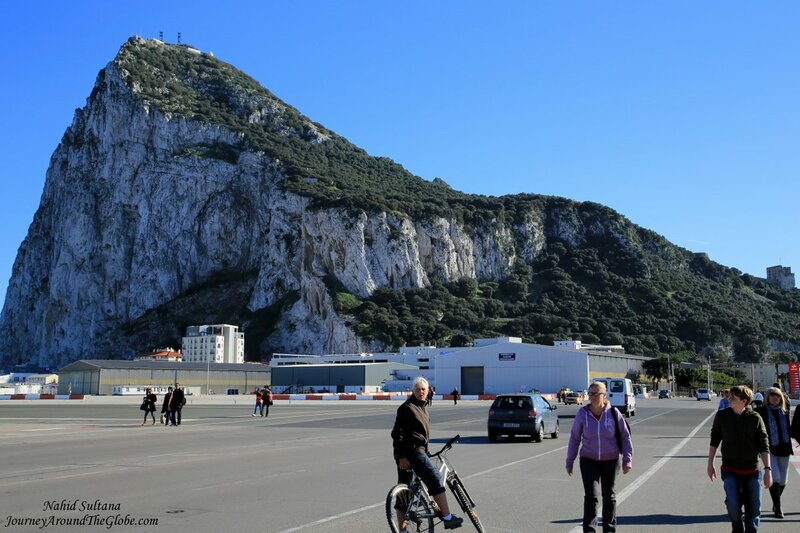 The land is bordered with Spain in one side and therefore the Gibraltarians are fluent in both English and Spanish. Speaking of language, we came to know that interestingly, may be the word “Gibberish” came from Gibraltar where they sometimes speak a mixed dialect with English and Spanish that sounds a bit like…Gibberish. 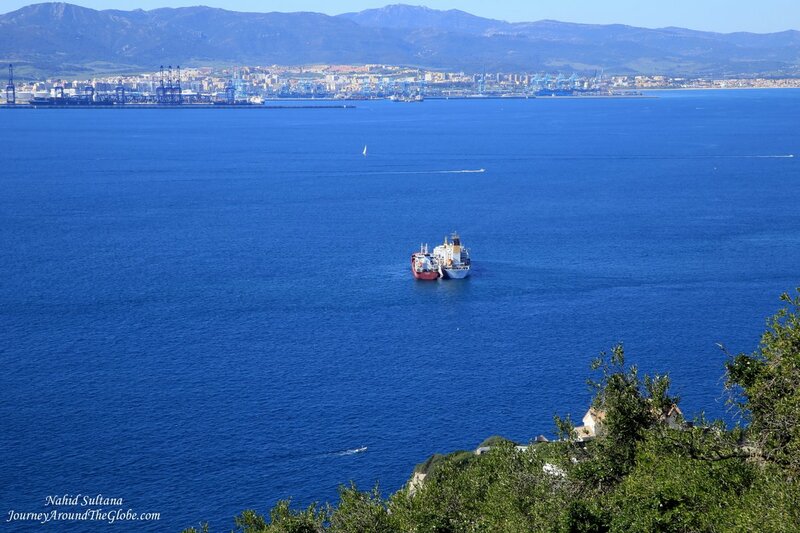 The name “Gibraltar” arrived from the man who came to this rock from Africa many centuries ago. His name was Tariq. So the place came to be known as “Jabal-Al-Tariq” which means “Mountain of Tariq” in Arabic. In 1704, it became a British territory. Currently, around 30,000 people live in Gibraltar and it gets as many as 7 to 8 million tourists every year. Gibraltar is surrounded by water from three sides with both Atlantic and Mediterranean and Spain on one side. Africa is only 14 miles away from here. You get stunning views from most of the corners of Upper Rock of Spain, Africa, Atlantic, and Mediterranean…it can’t get any better. Gibraltar doesn’t have any sales tax on any items. Therefore, lots of tourists come here to do major shopping. While local pound is the official currency, they also accept British pounds issued by Bank of England (not the ones from Bank of Scotland and Northern Ireland). Most of the places accept Euros too but your changes will may very well be in pounds. Driving in Gibraltar may not be that easy for new-comers, especially when going to top of the rock. Good part is that, they drive like the rest of Europeans and not like U.K. on the right-hand side. We left our car on the other side of the border in Spain and crossed border-control on foot. This was a better idea since there were couple big car garages on the Spanish sides and we didn’t have to worry about parking our car in Gibraltar. Another disadvantage of bring the car to the English side is that on our way back the queue to cross border check-point to Spanish side was huge, I mean…humongous. But those of us who were walking, the police didn’t even check our passports. TIME of TRAVEL: Gibraltar was the last destination of our Andalusian trip in Spain that we took in February of 2014. We checked out from our hotel in Seville on the 2nd morning and drove about 2 hours on scenic highway to get to Gibraltar. When I say scenic, yes…it was a very beautiful drive by the mountains and meadows and countryside. Weather in Gibraltar was mild, not too cold or too hot. But may get a bit windy when you are on top of The Rock of Gibraltar. OUR HOTEL: We didn’t stay overnight in Gibraltar. We spent the last two nights in Hotel Petit Palace Santa Cruz in Seville. From Gibraltar, we drove back to Malaga where we started our journey from to a catch an early morning flight back to Brussels. 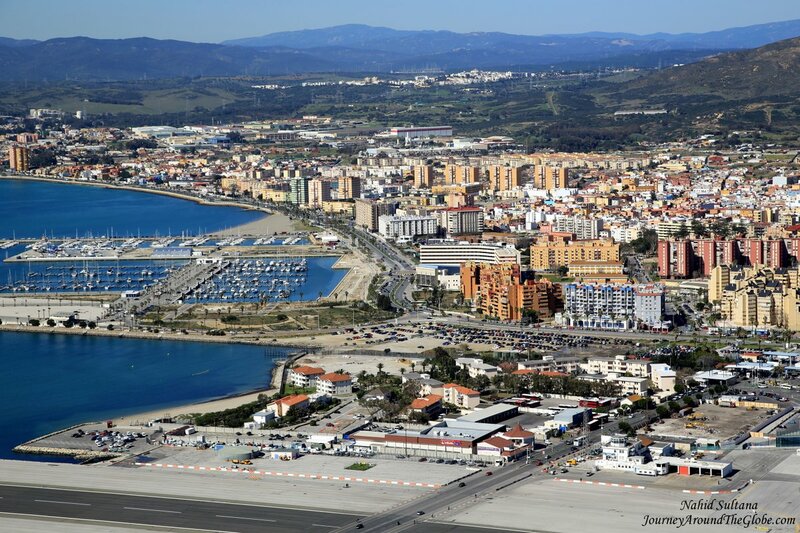 Last night in Spain, we stayed in Holiday Inn Express which was very close to Malaga Airport. I think it took us more than an hour to find this hotel, not sure if our GPS is to blame or the fact that you can’t really see the name of this hotel from the road. EATING and SHOPPING: By the time we reached Gibraltar from Seville, Spain it was already lunch time. We grabbed something quick from McDonald (there was also a Burger King) before crossing the border. In Gibraltar, the main city center has lines of many restaurants and shops. We picked up some finger-foods from an Indian places while walking back towards the border. City center is also a good place to pick up souvenirs and do shopping, as I mentioned above, there is no sales tax in Gibraltar. PLACES WE’VE VISITED: We hired a taxi from the first bus station right after crossing the border. It was for about 2 ½ hours guided tour for 80 euros for the whole mini-van which seats 6. We had it for four of us. But you can share a ride like this and share the cost. This was a quick and easy way to explore this place. Of course there were time limits with taxi but we did get to visit all the main spots and their highlights. You can walk up to the rock or take a cable car but with the kids, taxi was much smoother. Walking can be fun if you are fit to climb hilly road and the weather is good. Some people take the cable car up and walk down slowly and take time visiting all the attractions. If you have spare time, may be two other significant places here to visit would be the Moorish Castle and Europa Point. We couldn’t go to any of them because of time. Moorish Castle, from the 1300s, currently, is nothing but in total ruins. You can see the skeleton of it and the tower almost from anywhere. 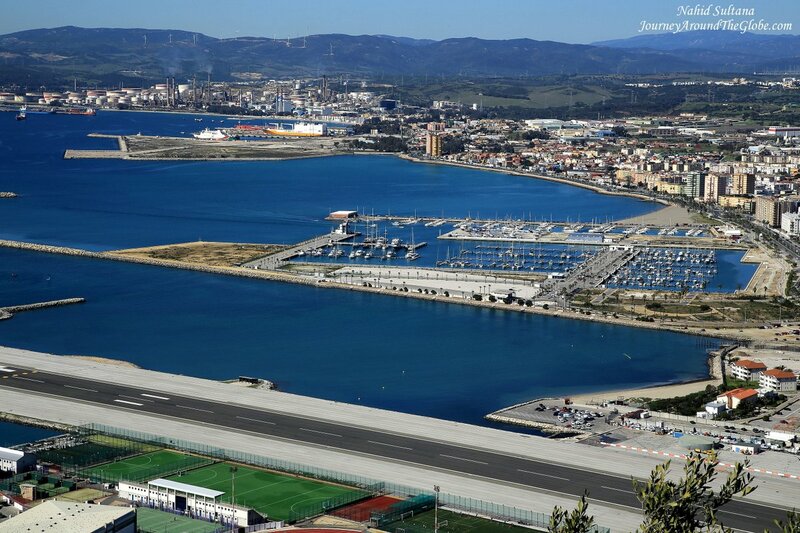 Europa Point is a military base which offers a fantastic view of the bay and continent of Africa on the other side. I don’t think tourists can go all the way to the tip of the Europa Point, but some people do go there as far as the officials allow. Other than these two, there are tons of tunnels in Gibraltar that enthusiastic tourists may find them interesting to discover. Casemates Square is a lively that we passed before walking back to the border control…a great place to hang out and watch world go by. 1) PILLARS of HERCULES or JEWS GATE: This is where our taxi took us first. This is a view-point from where you can see Gibraltar Strait where Atlantic Ocean and Mediterranean Sea come together. Europa Point and Jewish cemetery are also visible from this spot. The best part of it is that you get to see Morocco on the other side in the coast of Africa. 2) ST. MICHAEL’S CAVE: We drove up little more towards the tip of the rock and St. Michael’s Cave was our next stop. 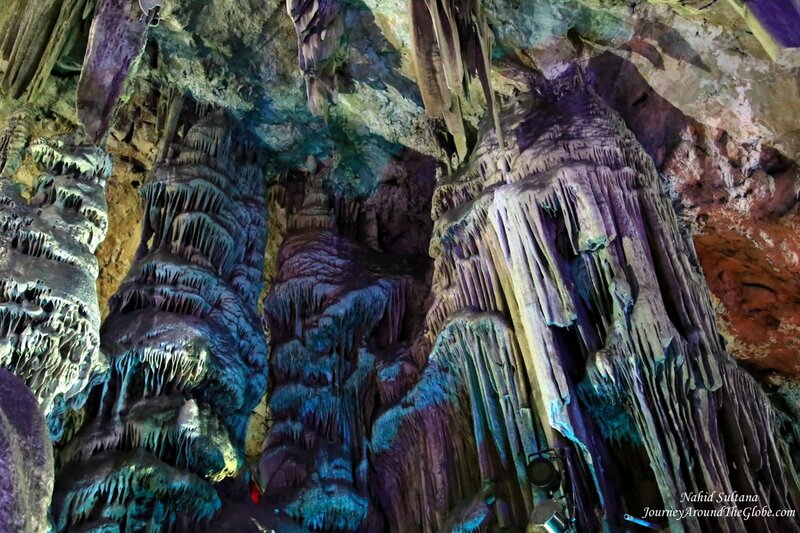 This is a gorgeous natural cave and definitely worth a visit. Just to give you an idea of the size of this cave, the visitors’ area is much smaller than Luray Cavern in Virginia, USA. 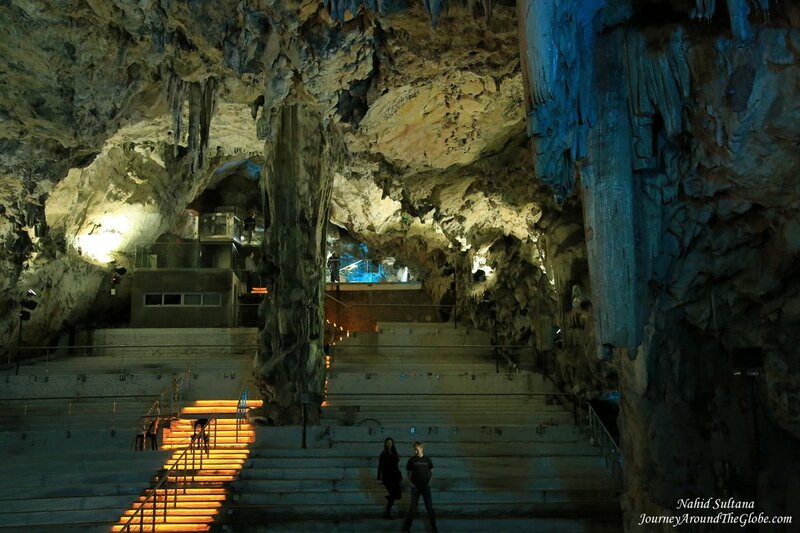 The impressive natural grotto of St. Michael’s Cave was long believed to be a bottomless cave. It winds downward some 700 feet into The Rock. The Upper Hall, fitted out as an auxiliary hospital in during WWII in 1942, but was never used, now it is used for concerts. It took us about 20 minutes to visit the cave. By the way, the cafeteria here is the last one to grab some food in the nature reserve of Upper Rock. 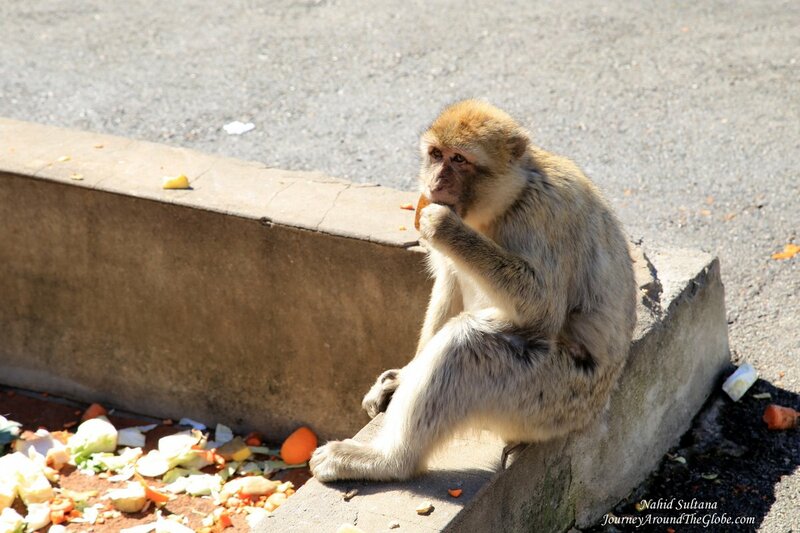 It’s better to finish your food before hitting the road again, monkeys here can be notorious and may attack or take away your food if they can smell it. 3) A MONKEY FEEDING STATION in UPPER ROCK: Drive from St. Michael’s Cave up to here was very scenic, after all, Gibraltar is surrounded by water on three sides. There are few of these monkey feeding stations all around the Upper Rock. These monkeys, Barbary Macaque, were brought here from Africa many centuries ago. They are used to seeing people all the time, but be careful…they are wild animals on loose. If you are driving your own car, it’s better to roll your windows up when you start climbing the rock. 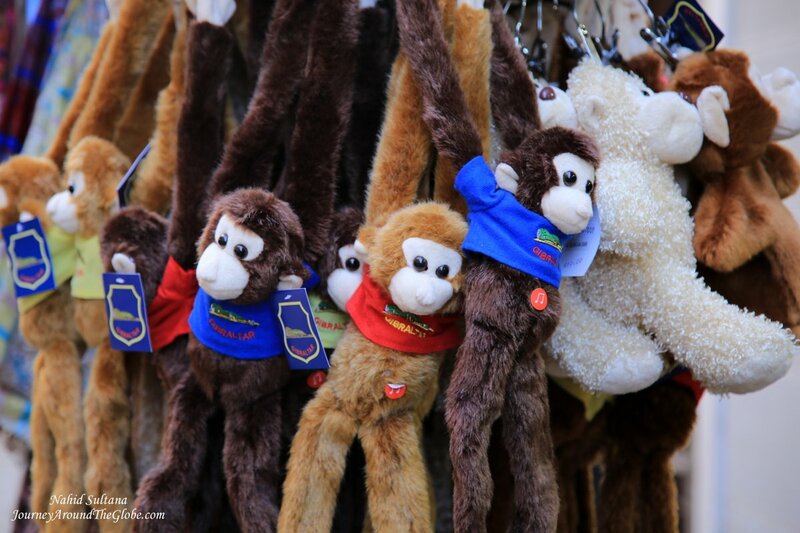 People of Gibraltar love their monkeys and the government actually takes care of them and feeds them at these stations. My girls took few pictures with these cute apes. 4) GREAT SIEGE TUNNEL: This was our last stop with the taxi and on The Rock. You get a fantastic view of Gibraltar, Spain, and all the other surrounding as you stand at the entrance of this tunnel. By the way, there is total of 33 miles of tunnels all around Gibraltar. Interestingly, British army hand dug this one, a 600 meter tunnel, from solid limestone. 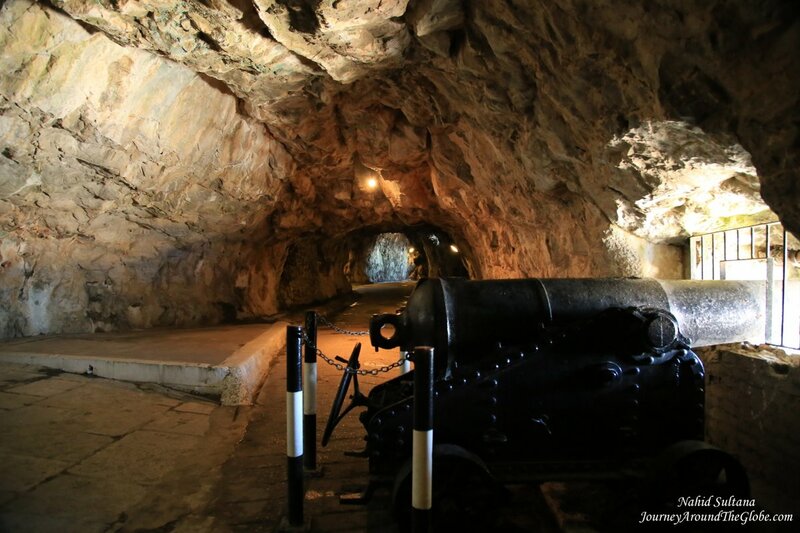 The tunnel was built in the 1700s to defend Gibraltar from the Spanish and French troops during the Great Siege. When the Great Siege ended in February of 1783, the original gallery was 370 feet long. After the end of Napoleonic War in 1815, the risk of war still remained in Europe. So British continued to improve the fortifications of the Rock by including an additional 7 miles (12km) of tunnels. Overall, this is a long snaky tunnel to discover with detailed information about events during the Great Siege and the usage of the tunnel during WWII. We stayed here about little less than half an hour. After the first part, you may need extra 30 to 45 minutes to go further deep into the tunnel where the gradient becomes steeper and some visitors may find the climb back quite tiring (don’t worry, there is a clear sign in the tunnel with this message). We came back from this point to catch the taxi…the girls were a bit scared too to go further. 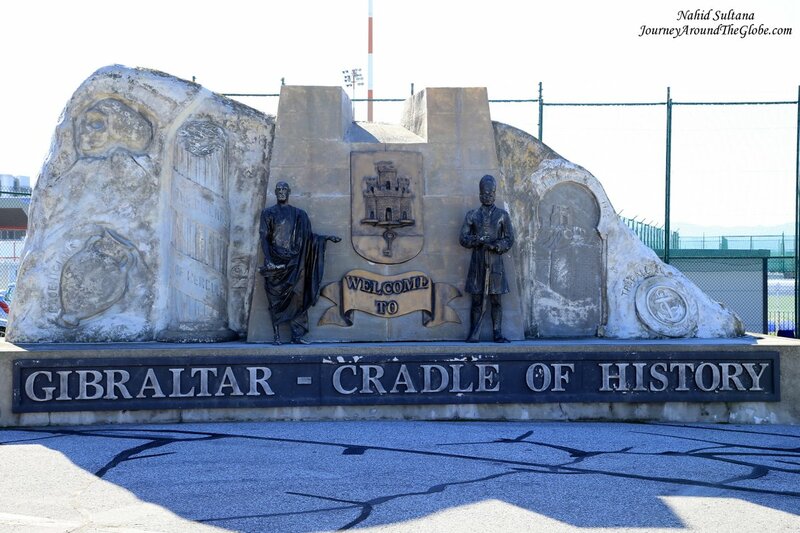 5) CITY CENTER: We were dropped off here by our taxi after our short tour of Gibraltar. This is more like a shopping alley with many fancy stores and local boutiques. There isn’t much to do here other than doing some tax-free shopping or having a good meal. There were some point of interests we saw in the information board, like a cemetery, museum, and other landmarks. We didn’t go to any of those place, just took a leisure stroll to both sides and started walking towards the border. 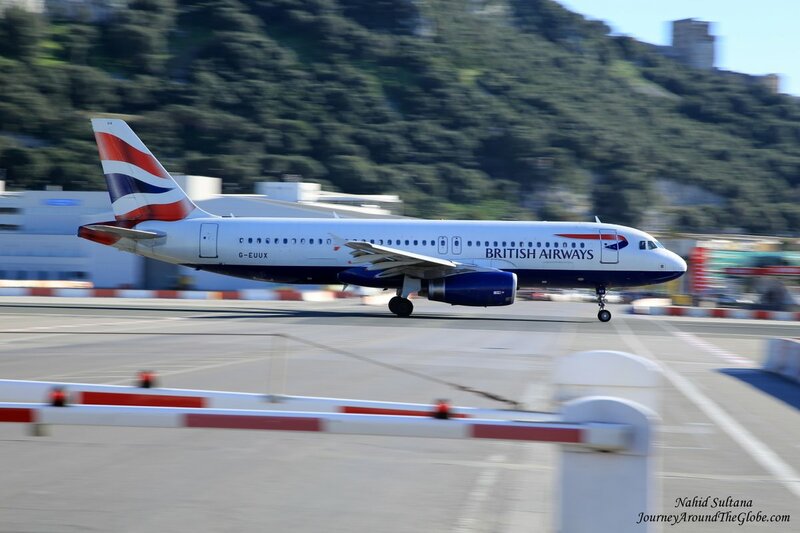 6) GIBRALTAR AIRPORT: Gibraltar Airport has a live runway, meaning it sits on a local street and general public can actually cross this stretch of road on foot or by car. The airport is only few steps from the border on Winston-Churchill Avenue. Fun part of crossing this street was, we were told by the airport securities to hurry up and cross the road quickly because a plane was about to take off and they are clearing all the people from the runway. So we hurried to the other side as a bar came down to stop all the pedestrians and traffic lights turned red to stop all the vehicles. In about couple minutes, we got to see a British Airways making its way to the runway and took off from that runway as all the audiences were going “wow”. We were lucky to see this site, not many people crossing this runway actually get to see an airplane taking off few feet away from them. You really did a thorough job of explaining and informing others about Gibraltar. Of course, I know all about the island rock but have never been there. Thanks for sharing!